We are at the tail end of the wild coho salmon season, so I thought I would take advantage of its availability. 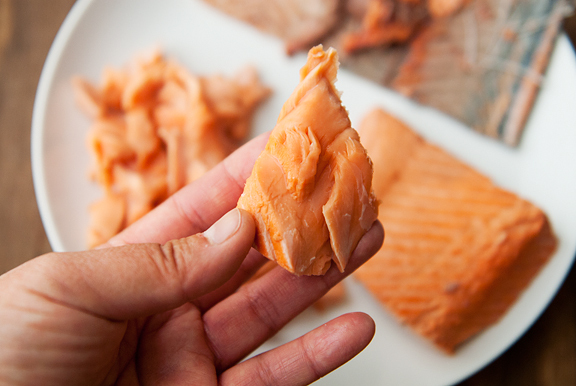 Wild salmon is recommended, but I imagine you could use farm-raised if you wanted. I prefer wild whenever possible. 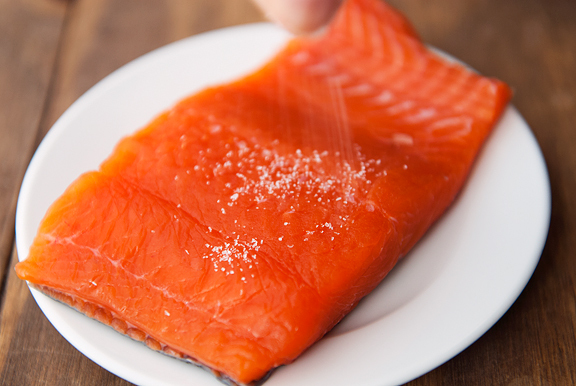 For the smoked salmon, you can use cold-smoked or hot-smoked salmon. Here, I’m using cold-smoked, but I have a hunch that hot-smoked salmon would be pretty amazing too. 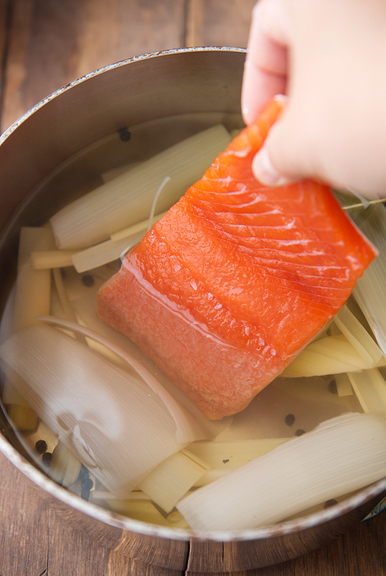 The salmon needs to rest in the salt for 30 minutes and the poaching liquid needs to simmer for 25 minutes – so start those first. When the salmon and liquid are ready, slide the filet into the pan, cover it, and let it sit for 10 minutes with the heat off. 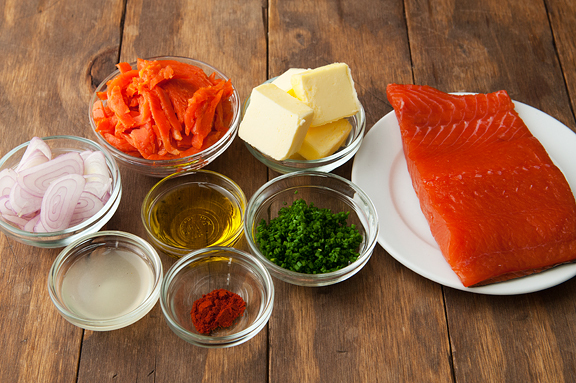 After the salmon is done poaching, it should be “just” done. Refrigerate the filet so it can firm up which makes it easier to flake. Discard the poaching liquid. Because the liquid gets discarded, I use a relatively inexpensive dry white wine. For some reason, I had it in my head that the shallots were to be sliced. Only after I sautéed them did I realize that they were to be minced. Easy enough to fix. 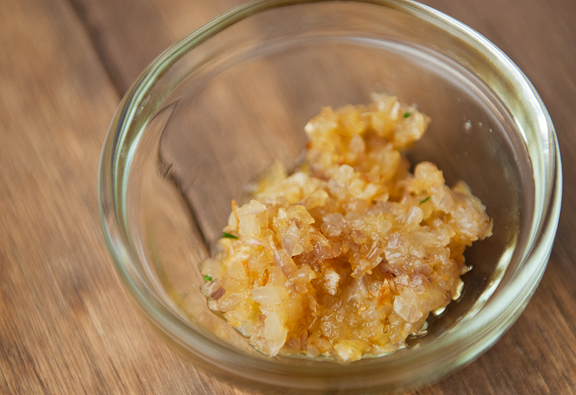 You don’t have to include shallots if you don’t want to, but they add a nice flavor to the rillettes. 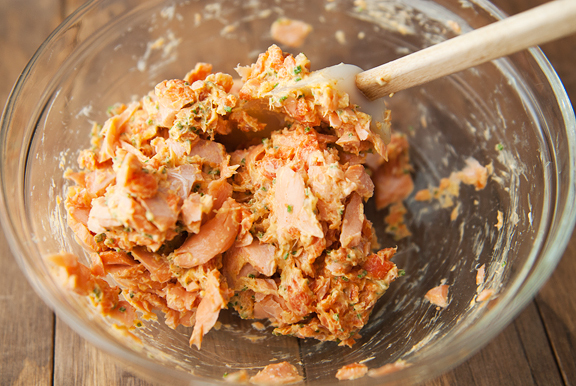 The fat that gets mixed into the salmon rillettes is butter. 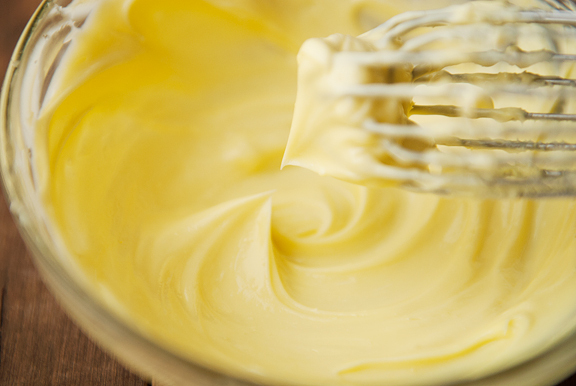 Start with softened unsalted butter and mash or whisk it until smooth. You want to avoid any lumps because that will ruin the texture. 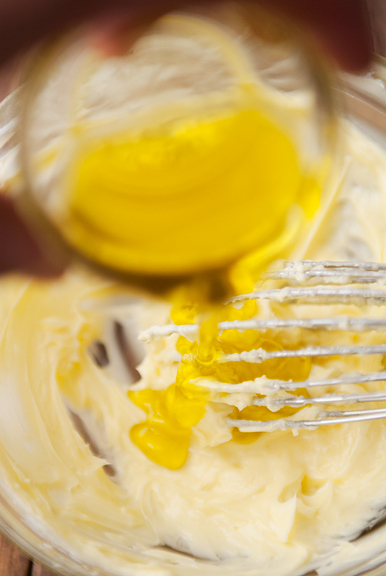 Then mix in the olive oil for a creamy, velvety spread. 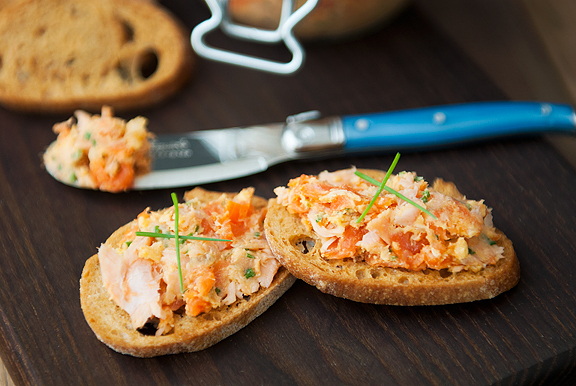 The result is a lovely, buttery, smooth spread dotted with chunks of melt-in-your-mouth salmon. It comes together far easier than I had expected and the salmon rillettes tastes like a million bucks. Spread it on crostini or crackers. This will make a terrific appetizer for any party and I cannot wait to serve it to my parents! Make the rillettes up to 3 days ahead and store it in the refrigerator. Serve at room temperature for maximum smoothness. If it’s cold, the butter will be hard and it won’t spread well. 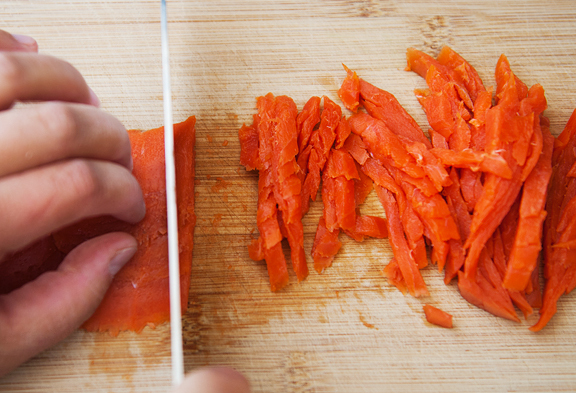 Remove any pin bones from the salmon filet. Salt both sides of the salmon (I used 1/4 teaspoon) and let it sit for 30 minutes. 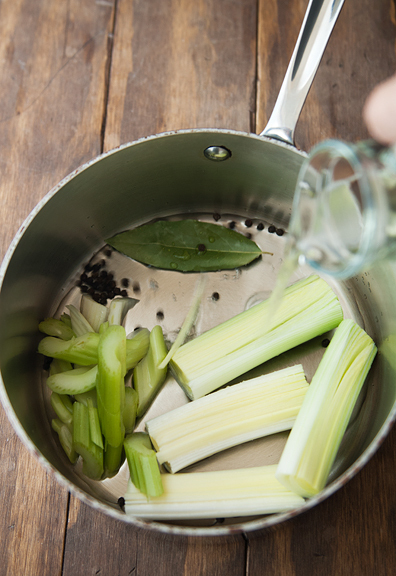 Meanwhile, place the celery, leek, bay leaf, black peppercorns, white wine, and water in a medium saucepan. Bring to a boil then reduce to a simmer. Let simmer for 25 minutes. 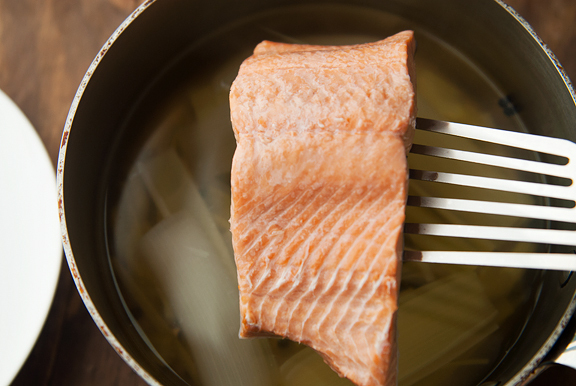 Place the salmon in the saucepan, cover with a lid, and turn off the heat. Let the salmon stand for 10 minutes. 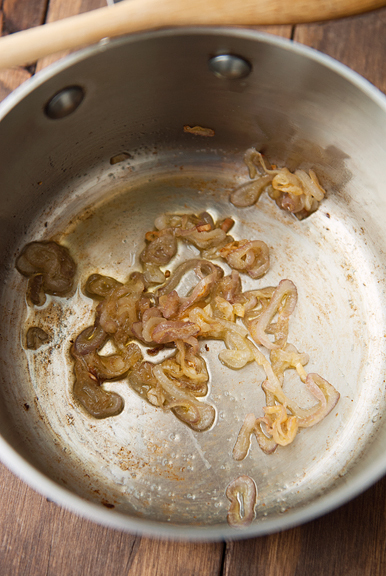 Remove the filet from the liquid (discard liquid and aromatics) and pick off any peppercorns that may have stuck to it. Cover the fish in plastic and refrigerate for 45 minutes. Remove the salmon skin and flake the fish into a bowl. 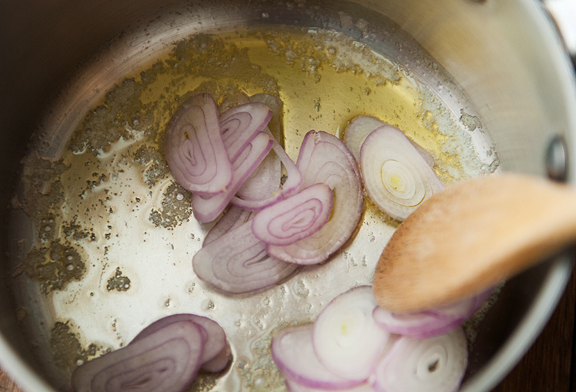 Heat 1 tablespoon of butter in a small saucepan and sauté the shallots until soft. Let cool. Mash the remaining 4 tablespoons of butter with fork or a whisk until smooth (make sure it is super smooth to avoid chunkage in the rillettes). Mix in the olive oil. 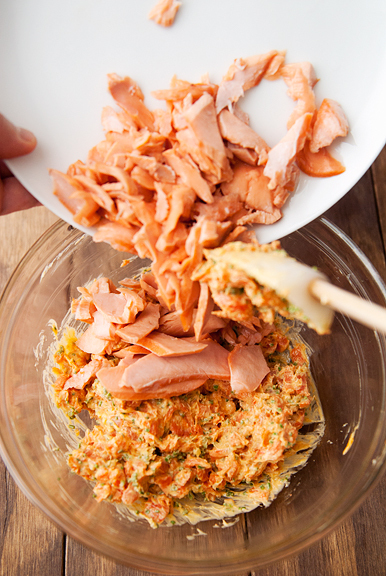 Stir in the lemon juice, chives, smoked salmon, and chili powder (or paprika or white pepper). Gently fold in the flaked salmon. Season with salt to taste. Serve with crostini or crackers. Makes 2 cups. Store in refrigerator for up to 3 days. A wonderful spread! So flavorful and refined. The recipe looks wonderful, but I’m really commenting on your neck and shoulder problems, which I share, as well as a job which requires me to spend (a lot of) time at the computer. 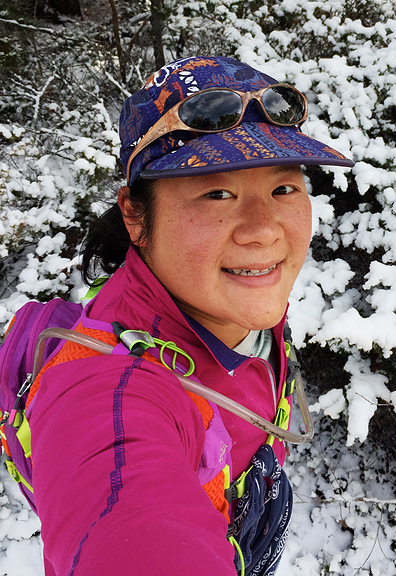 I’m sure that you, as I, have tried all sorts of physical therapy, exercise, massage and pain killers, so I will skip all of that, and simply tell you, that the single most effective thing that I have done, is to make standing my default work position. My desk is always elevated, and I only sit down for meetings – the benefit to my back and the relief from an otherwise general level of pain have been astounding. Good luck and feel better! Oh my goodness, that looks delicious! I am envious of your relationship with your dad. My dad never grew up, so our relationship is quite different. 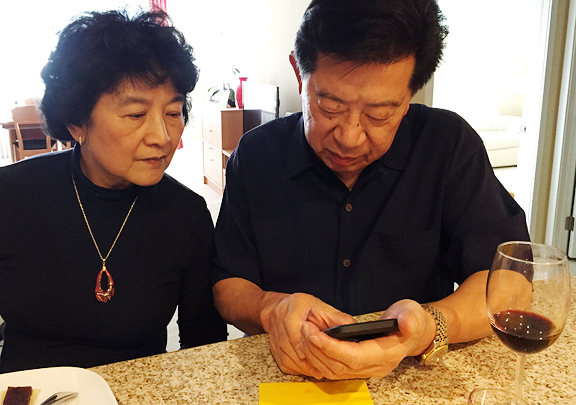 And wine with the iPhone lesson? I had enough trouble without wine…but maybe that’s because an 18 year old boy was teaching me, and they have trouble slowing down for their old mothers! Hope your pain issues resolve soon, though you sound as if it’s chronic. Ugh. 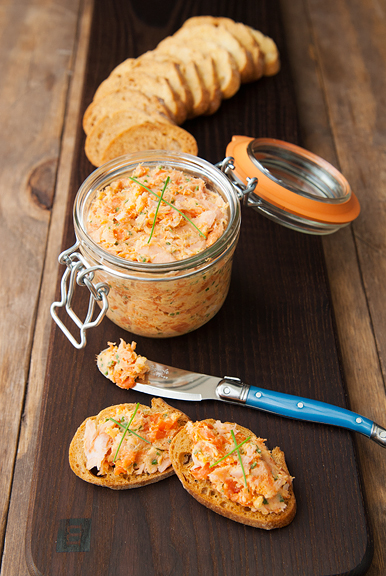 mmmm I’ve a go-to salmon rillette recipe but it doesn’t include any smoked salmon! I love my recipe but I am having a fit because I know that the addition of the smoked salmon would add another layer of deliciousness. It sounds like I’ll need to do a trial run (or three) of your version one because it sounds like it should be part of our Thanksgiving feast. Do a search on youtube for yoga videos which target the shoulders and neck – it’s un-freaking-believable how much better one feels after following along a few times. 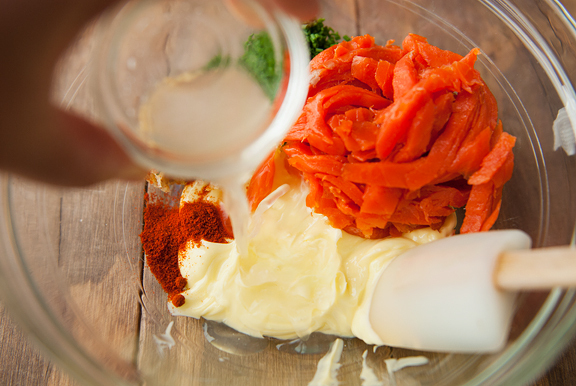 My mom loves salmon too, and I love making stuff that I know she loves too…. so this is a “must make” for me too, so thank you for the recipe. There’s nothing worse than neck/shoulder pain…, pls take care and I hope you feel better soon! What were the other courses? Rosa – it’s really delightful! Kristin – my dad is actually a big kid with a credit card and a driver’s license, but he can be a lot of fun when he isn’t trying to be an administrator ;) And thanks, the shoulder is MUCH better now. Nic – thanks!! and I hope you like it with smoked salmon. 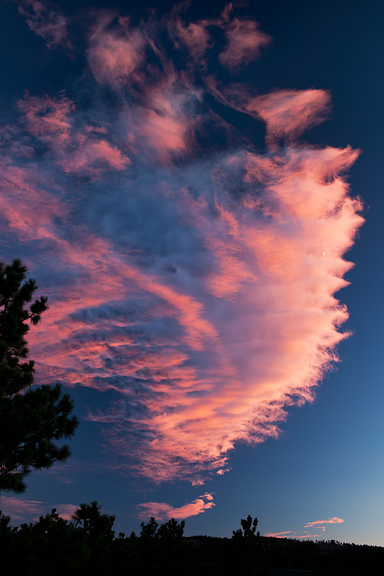 I think it adds a whole different dimension to it! 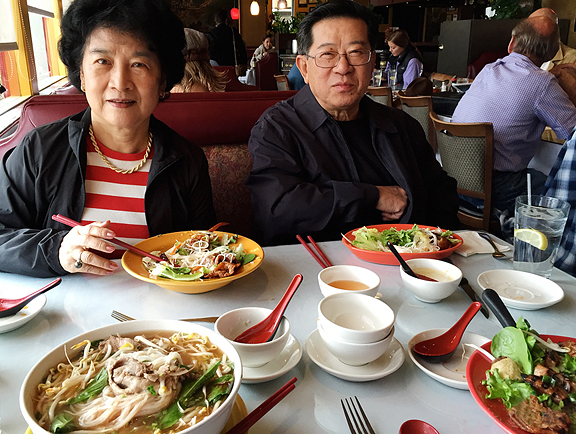 angelita carmelita – thanks and yay for moms! Charlie – oh, we had olives, brie with cranberry hazelnut seed crisps, mini crab cakes (my parents made them – they were so good), chilled shrimp with remoulade, sliced honeycrisp apple. I tried this and it was the most popular appetizer that night! Thanks for such a lovely recipe! But it got dry after one night in the fridge. Not as creamy as it originally was. Is it normal or how can I solve this problem? 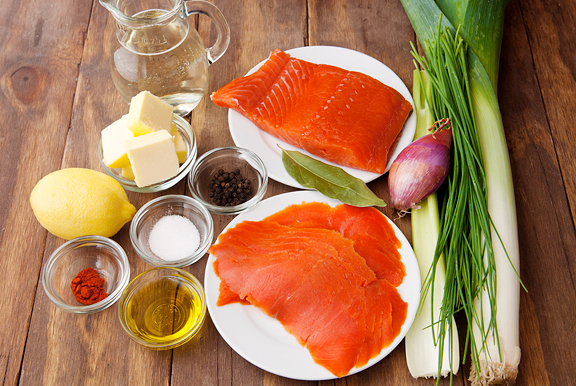 Drew – I imagine you would want to store it in an airtight container so that the salmon doesn’t dry out and also to keep the fish odors from permeating into the other foods in the refrigerator. Oh, and if you served it at a party and it sat out for several hours before being put away, it might have dried out a little then, too? Anna – yes, I think you can get away with a mild onion (sweet or use shallots) in place of the leeks.